Our network of 26 shops across Shropshire, Telford & Wrekin and Mid Wales help raise around £1 million a year to fund the vital care we provide to local families. We were named Charity Retailer of the Year in 2018, a national award of which we are so proud to receive! In this section you can find out all about our shops – including our furniture store and superstore – and how you can support us by donating quality items, shopping with us or volunteering your time. Our shops sell a variety of quality goods including clothes, household ware, books, CDs, and bric-a-brac. We also have a number of vintage and specialist items for sale and also sell a range of seasonal lines for Christmas, Easter and Halloween, so why not pop into your local shop and pick up a bargain? We are always on the lookout for quality items to sell so if you are having a bit of a clear-out our shops would be grateful to receive any unwanted goods you may have. If you can’t find the information you need on these pages then please contact our Retail team on retail@severnhospice.org.uk or 01743 272082. Find a shop near you Search for your nearest Severn Hospice shop by clicking here. 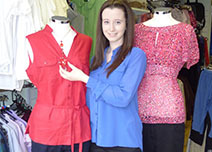 Volunteer in our shops Help out in one of our shops across Shropshire and North Powys, from dressing windows to working on the tills.